Facilitating a GPS like navigation system centered towards India’s navigation needs, to be launched sometime in the first half of March this year. This Mission will be the fourth satellite sent off as a part of the ongoing plan to create a navigation system in India. IRNSS 1A [July 2013] --- IRNSS 1B [April 2014] -- IRNSS 1C [October 2014] -- IRNSS 1D [March 2015]. The entire navigation system will be completed with seven such satellites sent off to space and functioning simultaneously. Two more named according to the series 1E and 1F are expected to be launched within this year. According to ISRO’s plan to establish the navigation system, four of them are supposed to stay inclined in the geosynchronous orbit, while three stationed in the geostationary orbit. USA has its own NAVSTAR Global positioning system (GPS) which was initially launched by the US for military purpose, which it started using for its general public with full capability not before 2000. China uses two similar types of its own. India will soon be joining this coveted list with its IRNSS after the successful positioning of its seven satellites. However according to the latest data available till April 2013, NAVSTAR and GLONASS have been operational. China is in the process of expanding its regional Beidou navigation system into the global Compass navigation system by 2020. The European Union’s Galileo positioning system is a GNSS in initial deployment phase, scheduled to be fully operational by 2020 at the earliest. France (DORIS), India, and Japan are in the process of developing regional navigation systems. This is an independent regional navigation satellite system being developed by India. Main aim of the satellite is to provide accurate position information service to users in India as well as the region extending up to 1500 km from its boundary, which is its primary service area. Standard Positioning Service (SPS) which is provided to all the users and Restricted Service (RS), which is an encrypted service provided only to the authorised users. Expected to provide a position accuracy of better than 20 m in the service area. IRNSS comprises of a space segment and a ground segment. Ground segment is responsible for the navigation parameter generation and transmission, satellite control, ranging and integrity monitoring and time keeping. The national space agency has lined up many launches before March next year. A PSLV to launch a commercial satellite from the UK, two navigation satellites, a GSAT series satellite and three satellites in IRNSS series are among the planned launches. A reusable launch vehicle would also be tested this year as a technology demonstrator. ISRO has also installed a Multi-Object Tracking Radar at a cost of Rs. 245 crore for which the trials would be conducted soon. The radar is capable of tracking 10 objects in real time simultaneously. Also a SAARC satellite is on the plans –which is set to be sued by the SAARC nations and it will be launched within 18 months after finalizing the deal with the other countries involved in the process. Cartosat satellites would be used to monitor illegal mining in the country. “The Indian Bureau of Mines has been given the task to draw the boundary lines for the miness. Countdown begins for the launch of India’s latest navigation satellite IRNSS-1D onboard PSLV-C-27 on March 28 from Sriharikota that would take the country closer to setting up its own navigation system on par with the GPS of the US. 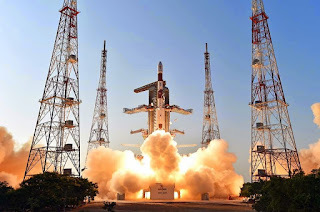 The launch of IRNSS-1D, originally scheduled for launch on March 9, was deferred after an anomaly was found in one of the telemetry transmitters. According to ISRO, while four satellites would be sufficient to start operations of the system, the remaining three would make it more accurate and efficient. The IRNSS system was targeted to be completed by this year at a total cost of Rs. 1,420 crore. Onboard workhorse PSLV-C27 that would pave the way for the country’s own navigation system on par with the GPS of U.S. However, while the ambit of the U.S. GPS was global, the IRNSS was meant for regional coverage. This will be will be targeted at South Asia and is designed to provide accurate position information services to users in the country as well as the region extending up to 1,500 km from its boundary. IRNSS applications include terrestrial and marine navigation, disaster management, vehicle tracking and fleet management, navigation aide for hikers and travellers, visual and voice navigation for drivers. Similar to the previous three launches, ISRO would use the “XL” version of the Polar Satellite Launch Vehicle (PSLV), its most reliable rocket, for IRNSS-1D which will have a mission life of 10 years. This is the eighth time XL version is being used after Chandrayaan-I, GSAT-12, RISAT-1, IRNSS-1A, Mars Orbiter Spacecraft, IRNSS-1B and IRNSS-1C. The 44.4 metre tall PSLV-C27 which has a lift off mass of 1,425 kg PSLV-C27 will put the satellite in Geosynchronous orbit at 111.75 degree east longitude with 30.5 degree inclination. India will now be able to make receivers able to locate themselves independently.